Easy, flavorful pan-roasted chicken simmered in broth, German curry ketchup and yogurt which imparts an oriental, “Indo-German” flavor. Reminiscent of the Austrian-Hungarian region, this dish blends Hungarian salami with two kinds of protein-laden beans, red peppers, gehrkins and curry sauce. Its thick, yet creamy texture and mild-flavor makes quark a great base for flavored dips. 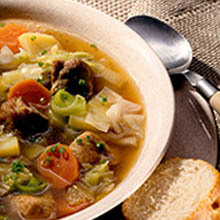 Healthy and hearty cabbage soup flavored by bacon, onions, chopped vegetables and Hela curry sauce. A well known German dish of sauteed strips of steak or filet mignon in a creamy curry sauce flavored with red wine and chanterelle mushrooms and mild curry sauce.